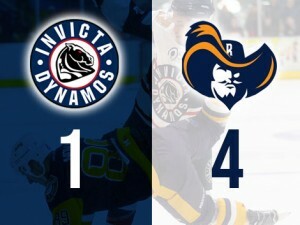 A neat finish from Arran Strawson was not enough to secure a share of the points on Saturday evening as the Invicta Dynamos lost out 4-1 at the hands of the London Raiders in Gillingham. Dynamos were at full strength with the addition of Mustangs player Luke Thirkettle. The Raiders were missing players from the NIHL 2 side as well as Ollie Baldock, Callum Burnett and Ashley Jackson. The Raiders quickly opened the scoring as JJ Pitchley roofed the puck into the top corner of the net just 14 seconds into play from close right. The visitors then thought they had extended their lead soon after but the shot from Juraj Huska hit the post with the puck then bouncing off the plexiglass. Dynamos, desperate for their first goal, had Luke Thirkettle and Joe Allen link up but Allen could not force the puck past Ben Clements from close range. Brandon Miles tried a shot from the right post but it was deflected off of Clements’ pads before the Mos forward then fired his own rebound into the netminder. Miles passed to Louis Colvin soon after who tried with a top left shot but the goalie gloved it. Goal two for the Raiders was scored by ex-dynamo, Aaron Connolly at 08.32 – Raiders attacked 2-on-1 and Connolly finished with a one timer from right in front. Oskars Ancitis came down the right wing and sent a wrist shot towards Clements but the netminder saved with ease. Thirkettle and Julian Smith collided in the corner and Smith was sent to the floor with a hit from the Dynamos forward. Dynamos defenceman, Arran Strawson then made himself known with a hit on Blahoslav Novak into the Raiders bench. First period ended with a scramble in front of the home net as the Raiders tried for their third goal of the night. John Connolly received a two minute holding penalty which allowed the Dynamos to pin the visitors into their own end. Strawson flicked the puck over Clements on the backhand from point blank range which gave the Dynamos their first of the night – the goal timed at 23.27. Raiders quickly tried to extend their lead as Jake Sylvester recovered from a hit against the boards and scrambled to the slot where he shot low beyond Connor Morris – the visitors Raiders with a two goal lead once again then at 25:34. Thirkettle received a two minute slashing penalty giving the Raiders a powerplay and the visitors took advantage of their powerplay with a cross ice pass from Huska finding Sylvester in the right circle who secured his second of the tie by sweeping inside the near post at 28.14. Ancitis tried his luck with a wrist shot on Clements but it was deflected up and over the plexiglass. Morris was then tested as Sylvester and J. Connolly tried to flick the puck up and ram it into the net with the goalie was caught on the netting but Ryan Morgan saved the shot behind Morris as the netminder struggled to get himself back into position. Ondrej Zosiak teamed up with Jake Stedman and the pair sandwiched ex-Dynamo Mason Webster between them and sent the Raider sliding head first down onto the ice. Second period ended 4-1 to the Raiders. Third period began and the tiring Dynamos side played defensively to stop the Raiders increasing their lead anymore. The visitors tried to add to their advantage as Sean Barry sent a slapshot towards Morris but the netminder saved with ease. Lewis English tested Clements with a few shots from in front of the net but could not get it past the Raiders netminder. Miles and Novak pushed and shoved with less than 30 seconds left of the game, the whistle was blown and the pair continued to shove but realising there was hardly any time on the clock, the two headed to their benches. End of the game and the local rivals took the two points. The Dynamos used their physicality to keep the Raiders from scoring in the third period which allowed the game to end 4-1.